Not too shabby..I'd like to see a wooden version of this playhouse/clubhouse built- it wouldn't be too difficult. 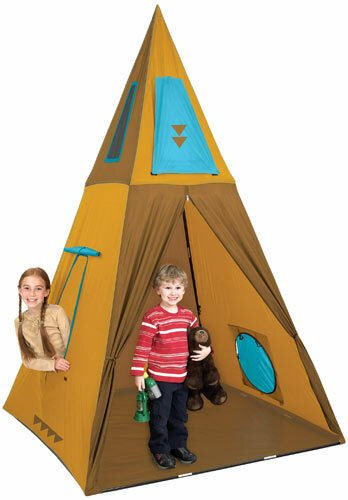 This teepee is listed as almost 8' feet tall- still small enough to fit in most rooms/homes. 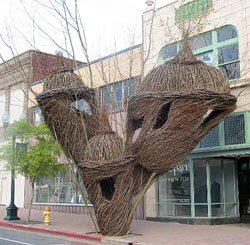 A woven willow treehouse sculpture by artist Patrick Doherty....who installs these non-permanent exhibits nationwide....pretty dang creative. Here's a little backyard shed beauty! 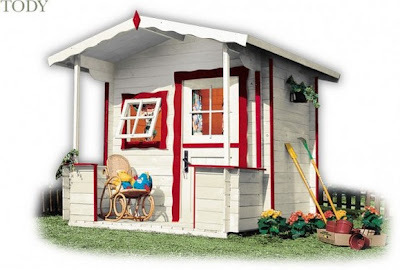 Be it a clubhouse/fort, or for a shed office, or potting station, this is a great little example of simple lines, straight-forward design, and bold trim colors. It could make for a great little cabin or tiny house in the woods, an icefishing shack, or just a small getaway studio for writing or yoga. 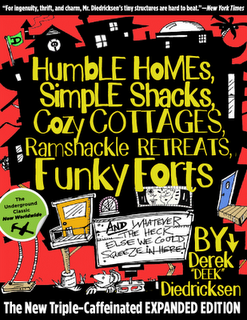 Derek "Deek" Diedricksen runs the blogs Relaxshacks.com, and FortaDay.com, Hosts "Tiny Yellow House" TV on youtube, teaches building workshops for The Tumbleweed Tiny House Company and is author of the bestselling tiny house, fort, cabin, treehouse, and cottage design book "Humble Homes, Simple Shacks" which you can check out by clicking HERE. 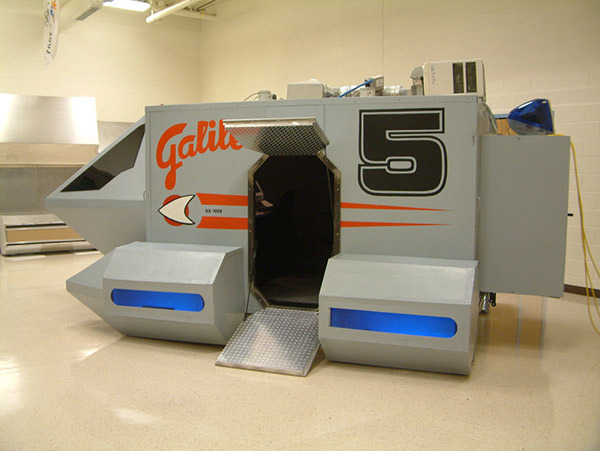 This actually was a flight simulator, owned and built by N.A.S.A., that was up for auction a ways back, and something, as it was suggested in a few cases, that might make for an incredible fort for some really, really, wealthy and geeky kid (or more likely an adult). It ain't the Millenium Falcon, or the Starship Enterprise, but it would certainly be something all your nerdy friends would envy. Woven Willow Forts/Playhouses for Kids...Why not? When its outgrown its use, there's no dismantling, and no dump runs needed- a fort like this would simply rot and return to the earth. That could also be considered its downside. I love this idea though, and its something I'd like to try at some point. 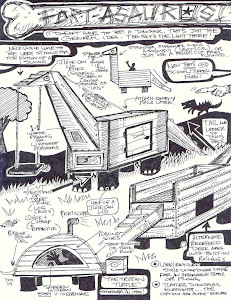 Its so simple too- just build a base, drill holes around the perimeter, stick the long branch lengths into the holes and tie them/bring them together at a peak, and then weave in the walls. This is something I've been working on/sketching out ideas on, that could work for both kids and adults. 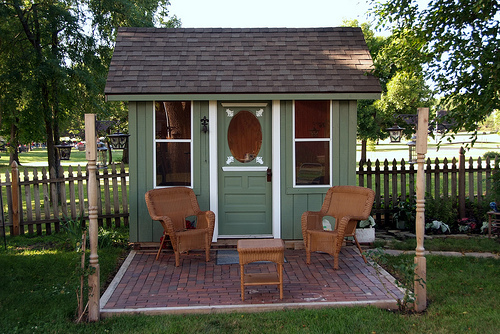 It could either be used as an office in the backyard, or a playhouse, bunkhouse, or small vacation cabin/cottage. Something like this, which would be 8' by 10' in size (or 6' by 8'), would run around $2000, or less, in materials. 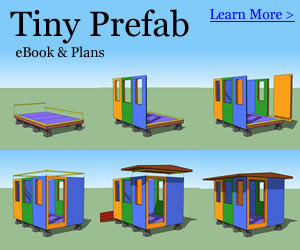 This tiny, tiny, tiny house would also have a wet bath, or at least a small bathroom set-up for a composting toilet.